Ok, so warmer temperatures are supposed to creep into Missouri over the next couple of days. That means, I need to get prepped to hit the trail. I’m still without a new pair of boots, but that is not going to stand in my way. As we posted earlier my left boot started to split at the toe. Time for a quick/cheap fix! 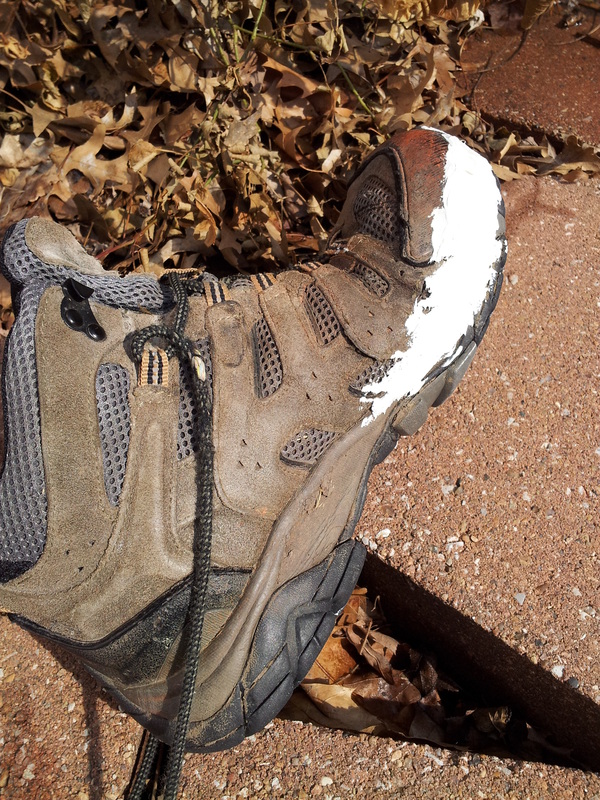 Being resourceful, I have made a temporary repair of the boot. Bathroom caulk should do the trick! It looks as though I might have stepped in a pile of cake icing. It will do for now, and with the snow on the ground no one will even notice it. As a backup I do have some nice brown duct tape that will work in a pinch! So hopefully, I will be getting back on the trail in the next couple of days. Looking forward to clearing the cobwebs off the gear and out of my head! This entry was posted in Hiking, Hiking Blog and tagged Blue Springs, boots, gear, Hiking, Mo., Scott Powell. Bookmark the permalink.